Are you a goal setting or do you prefer to go with the flow? Yesterday was our first meeting for the year for the Hunter Romance Writers. It was only a small gathering but the discussion was very vigorous (ie we talked a LOT!) as we caught up on each other’s news, discussed our goals for the forthcoming year and shared the difficulties we were currently facing. SE Gilchrist presented us with a few exercises on how to find a balance in our lives. It’s so hard to find that elusive balance – wanting or needing to write being pulled against other commitments like family, work, volunteering. Not to mention finding the time to take care of ME – the part that often gets neglected until we fall in a big heap and can’t go on. I’ve taken steps already this year to take better care of myself. I’m eating better, losing weight, walking most days, have started back at yoga and am trying to meditate. Of course, it’s early in the year – let’s see how I go once the craziness of the school year kicks back in. My writing goals are to write a second book in the Jacaranda Avenue series, following on from Return to Jacaranda Avenue. I’ve started but I’m still at the point where I’m trying to get to know my characters so it’s all very disjointed. I’m hoping to be able to send that off to the publisher around September, but that will depend on what happens with my day job. After that, the current plan is to write the 3rd book in the Hope Creek series. It’s been a while since I’ve been in that world, and I love the township and people. However I also have a secret passion project that keeps popping into my head begging me to write it. I’ve already been lost down the Trove rabbit hole a few times! That’s why my goals are so important to keep me focused. I’m definitely a goal setter. I love a good ten, five, three, one year plan. Monthly and weekly goals help to keep me on track. I find I flounder if I don’t have them – or get lost forever researching on Trove! Care to share your goals for the year? You raise some very relevant issues for me Kerrie. I have just emerged from an eighteen month unintended hibernation where, try as I might, I just couldn’t write or do anything ‘authorly’. But on January 1st I received an email from USA that changed everything, or rather, was the catalyst for my change. The publisher of my first four books returned the rights to me. The contracts had expired and I had requested not to extend them. So, this year I made a plan. I’m recovering and doing slight revisions on the novels and will re-publish them independently. I’m releasing a book I’ve been writing since 2011 in March. And I have another four releases planned this year. It’s a huge load, but I needed a good kick to get me going. I feel great. I’m a writer again. And my plan is all written out with timelines. Thanks for your fabulous article. Cheers, Noelle. Thanks for the comment, Noelle! Congratulations on having your rights returned and I’m so glad it’s been the catalyst for you. 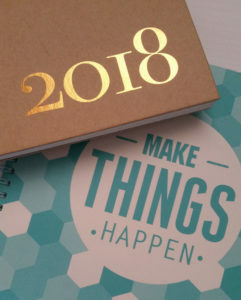 You certainly have some great goals for the year – you’ll be busy! I’ve been in that hibernation too, so I know what a relief it is to finally be doing writer stuff again! Happy New Year Kerrie! I’m a goal setter, but they’re loose goals… but all but 1 of my main goals for 2017 came true. My writing goals- publish 2 books in 2018, get to the point where my book sales support my writing costs, build my newsletter lists. Develop my FB ads and Amazon ads. Start writing the next book . I think can do it, too!! That all sounds doable! Good luck, Bernadette!